RSS reacts after Prime Minister Narendra Modi rules out bringing out an ordinance to aid the construction of Ram temple. After Prime Minister (PM) Narendra Modi ruled out an Ordinance on the Ram temple issue on Tuesday, and said his government would wait for the Supreme Court judgment, the Rashtriya Swayamsevak Sangh (RSS) said the people of India expect the current government to fulfil its promise to construct the temple during its current tenure. The RSS said the people of India voted for Modi-led Bharatiya Janata Party (BJP) to power in 2014 on that assurance. The RSS is the ideological fount of the BJP. Over the past couple of months, the RSS and its affiliates have demanded the Modi government bring an Ordinance, or pass legislation in Parliament, to pave the way for early construction of a Ram temple in Ayodhya. In his Vijayadashami speech, RSS chief Mohan Bhagwat said the people cannot interminably wait for the court order, and had asked the government to pass a law. At a rally that the Vishva Hindu Parishad held in New Delhi in December, RSS second-in-command Suresh ‘Bhaiyyaji’ Joshi said there were circumstances when people begin to doubt the judiciary. “It is the duty of Parliament to pave the way for construction of Ram temple… We are not begging,” he had said. The next hearing in the case is on January 4. In the Palampur resolution, Hosabale said, the BJP stated it favoured a resolution of the issue through dialogue or Parliament bringing an “enabling legislation” for construction of a Ram temple. “Modi-led BJP in its manifesto for the 2014 polls promised to explore all possible avenues within the framework of the Constitution for construction of a Ram temple. The people of India had trusted Modi and given the BJP majority,” Hosabale said. 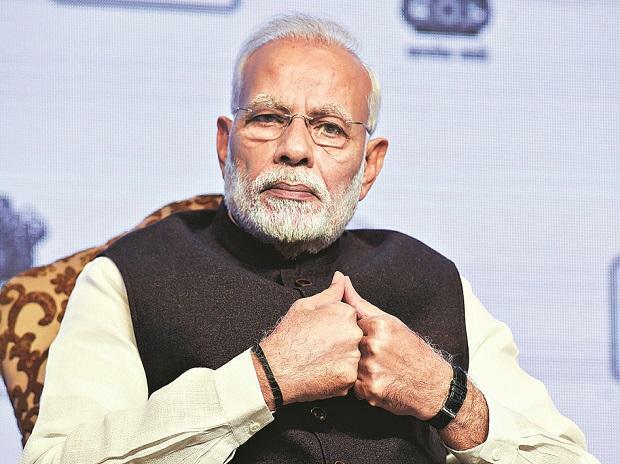 In his interview to news agency ANI on Tuesday, Modi said any decision on an Ordinance on Ram temple in Ayodhya can happen only after completion of the judicial process. He, however, also said the government was ready to make all efforts to fulfil its responsibility. “Let the judicial process take its own course. Don’t weigh it in political terms. Let the judicial process be over. After the judicial process is over, whatever is our responsibility as the government, we are ready to make all efforts,” the PM had said. Modi drew parallels with the triple talaq case. He said an Ordinance came only after the Supreme Court order. He also accused the Congress of delaying the judicial process in the Ram temple case through its lawyers.